Definition - What does Feet Behind the Head Pose mean? Feet behind the head pose is a yoga posture that serves as a strong hip opener and offers a variety of other benefits. It is a seated pose in which the legs wind around the shoulders and behind the head. 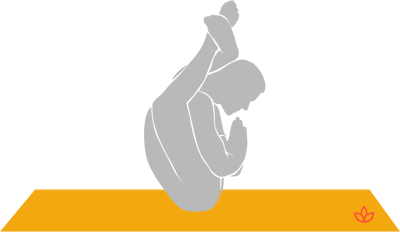 The hands are typically placed in anjali mudra (prayer position), but in an advanced version of the pose, the hands are placed on the floor and the body is lifted as the arms straighten. This pose is also known by its Sanskrit name, dwi pada sirsasana. On a spiritual level, the pose supports inner truth and self-knowledge, among other benefits.